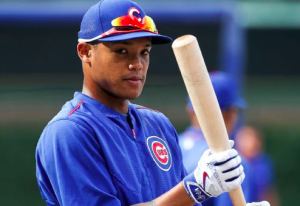 The Chicago Cubs have been without shortstop Addison Russell for nearly a month because of a foot injury. Unfortunately for the Cubs, they will continue to be without their opening day shortstop for at least another three weeks. The Cubs announced Thursday night that Russell re-aggravated his plantar fasciitis prior to a minor league rehab game on Wednesday. The team is hopeful but uncertain that Russell will make it back before the end of the regular season. Russell has been on the DL since the early part of August. He was able to play in a minor league rehab game on Monday, going 1 for 3 and playing four innings in the field. The Cubs were hoping he’d be back in a matter of days. But Russell was then scratched from a rehab game on Wednesday because of foot pain. He was sent back to Chicago to be examined by an orthopedist and subsequently shut down. With Russell’s return no longer imminent, the Cubs will continue to rely on Javier Baez at shortstop. Baez had a productive August, hitting .290 with seven home runs, posting an OPS of .862. He’s also started every game at shortstop since Russell went to the DL. But he says he’s plenty fresh to keep playing during the stretch run. However, Maddon says he has to be careful with Baez over the final month of the season. The manager’s concern is that the Cubs have no options at shortstop if Baez were to go down with an injury before Russell is able to return. Maddon plans on using utility man Ben Zobrist at shortstop to give Baez a couple days off in September. Zobrist has logged nine innings at shortstop this season but hasn’t started a game there since 2014. Staying healthy is going to be a key for the Cubs the final month of the season. Chicago holds a 3.5-game lead over Milwaukee atop the NL Central. But the Brewers look like a team that’s going to be competitive all the way to the end, so the Cubs can’t afford a slip up late in the season. Without Russell, the Cubs have managed to go 16-11. They’ve been led by strong offensive performances by players like Baez, Anthony Rizzo, Kris Bryant, and Willson Contreras, who is also on the DL. In order to win a second straight division title, the Cubs will need to keep hitting and remain healthy during the final month of the season.